“Heaven’s Coast” is a series of photographic images that capture connections to the ocean and the coast. The show, with the title inspired by a memoir by Mark Doty, tells a story about the unique ways in which we experience our coastal landscapes. Using a photojournalistic style to document different activities and moments, the images are then transferred to large stretched canvases to alter the scale of the work. 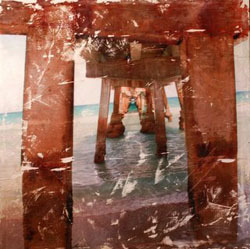 The transfer process is imperfect, resulting in images that look slightly distressed and aged. Raised in Florida, Tara Thompson is a self-taught documentary and fine arts photographer. Influenced by her former career in environmental conservation, Tara’s work documents the stories of our communities and the lives of everyday people. Tara also focuses on connections between people and landscapes as well as on the ways in which we create a sense of place. Currently, she is working on a personal project to photograph rural communities, the decline of family farms, and the impacts of the loss of farmland on the environment. Tara lives in Nashville, TN and works as a freelance photographer. The Art House Gallery was established in 2002 to offer outstanding local artists a gallery to present their work to a regular network of collectors and enthusiasts. The only Nashville gallery focusing solely on local fine art, The Art House shows work in a variety of media including pottery, painting, photography, mixed media and sculpture. Whitney Ferre and Christy Shuff are the co-owners of both the Art House as well as Rumours Wine & Art Bar. Becca Durnin is the director. Exhibits change monthly and special commissions by any of our artists are welcomed. Previous postThe Features and John Lennon's Ghost Next postActor's Bridge of Nashville Presents "How I Learned to Drive"